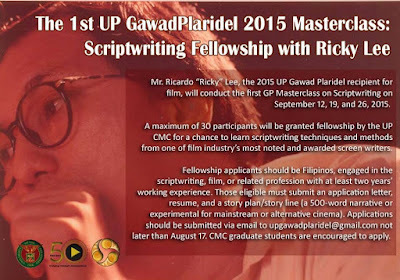 Mr. Ricardo “Ricky” Lee, the 2015 UP Gawad Plaridel recipient for film, will conduct the 1st UP Gawad Plaridel Masterclass (GP Masterclass) on Scriptwriting on September 12, 19, and 26, 2015. A maximum of 30 participants will be granted fellowship by the UP College of Mass Communication for a chance to learn scriptwriting techniques and methods from one of film industry’s most noted and awarded screen writers. Fellowship applicants should be Filipinos, engaged in the scriptwriting, film, or related profession with at least two years’ working experience. Those eligible must submit an application letter, resume, and a story plan/story line (a 500-word narrative or experimental for mainstream or alternative cinema). Applications should be submitted via email to upgawadplaridel@gmail.com not later than August 17. CMC graduate students are encouraged to apply. The GP Masterclass is the first extension activity launched by CMC as part of its golden year anniversary. It is part of the mentoring agenda of the UP Gawad Plaridel, the highest award by the University of the Philippines given to outstanding media practitioners. The award bestows honor on Filipino media practitioners who have excelled in media (print, film, radio, television, and new media) and performed with the highest level of professional integrity in the interest of public service. It is hoped that through this masterclass, the GP recipients’ expertise, knowledge and skills acquired through the years are passed on to the next generation of media practitioners. Successful applicants will be named during the Gawad Plaridel ceremony on August 26 at the Cine Adarna, UP Diliman.